As for Runescape's now 15-year life cycle, a great many players have been hit with the banhammer from developer Jagex. Many of these players will not have had very valuable accounts, but some had in-game banks filled with ultra-rare items worth millions, or even billions, of gold. Before now, the banks of banned players have been forever inaccessible, the items lost in the void. 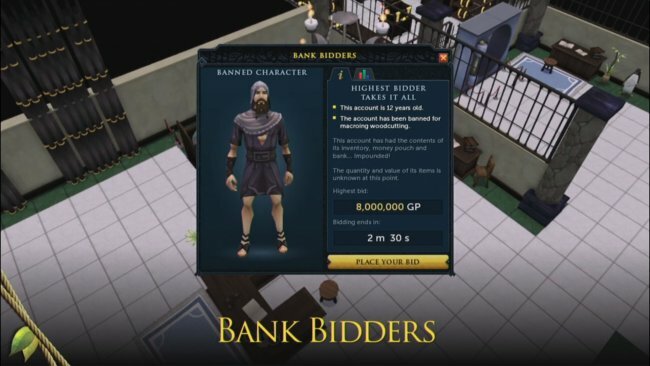 This past weekend at RuneFest however, Jagex announced Bank Bidders, a way to bring these lost items back into the game. While many of the features are still subject to change, right now Bank Bidders lets the player see what the account was banned for, how old it is, and their stats. What they won't be able to see, however, is what the bank account actually contains in terms of items, making it a gamble for those using money to bid. This feature, along with more Runescape news, was announced at RuneFest, the annual Runescape convention that happened this past weekend. What do you think of this upcoming feature? Will re-introducing extremely valuable old items be good for the in-game economy of Runescape?